Those that saw my last post recall I was in California this week. 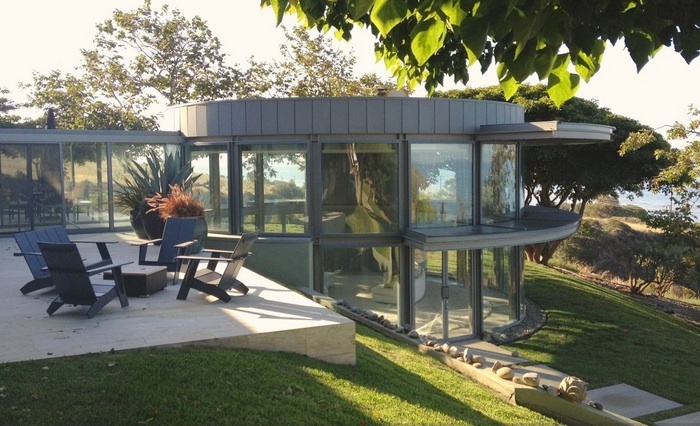 Malibu has to be in the top ten most beautiful spots in the USA. After some issues with the initial home rental I found this one and it proved to be much more than we would’ve ever hoped for. Here’s the house as we saw it at www.vrbo.com. 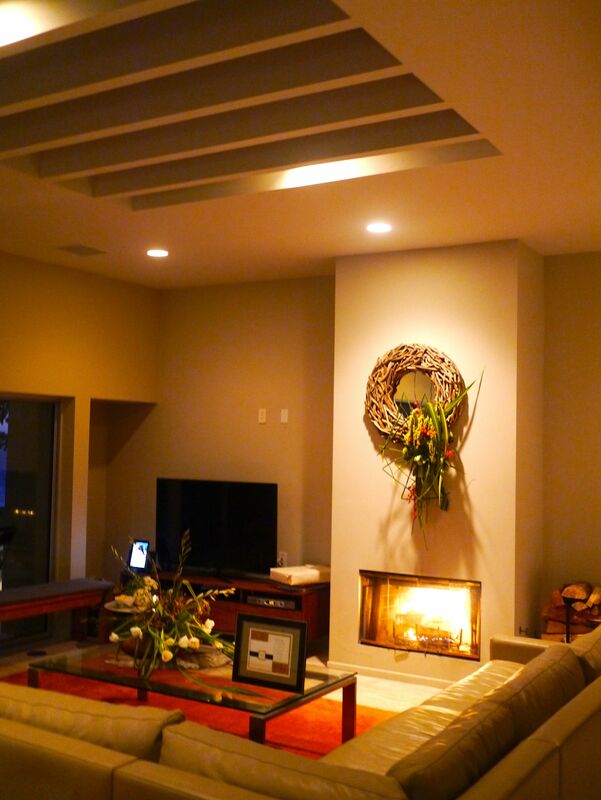 This is simply a round room with a 16′ celing…two sofas, a fireplace and a wide-screen television. This is the living area of the main house…up a level from the round room. 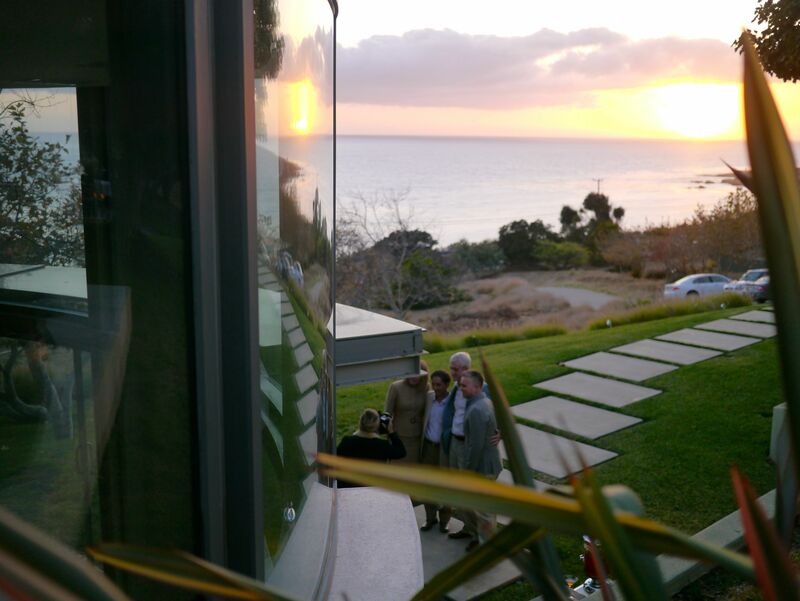 I was certainly happy and honored to stay in this home three nights. However, it was not a vacation. 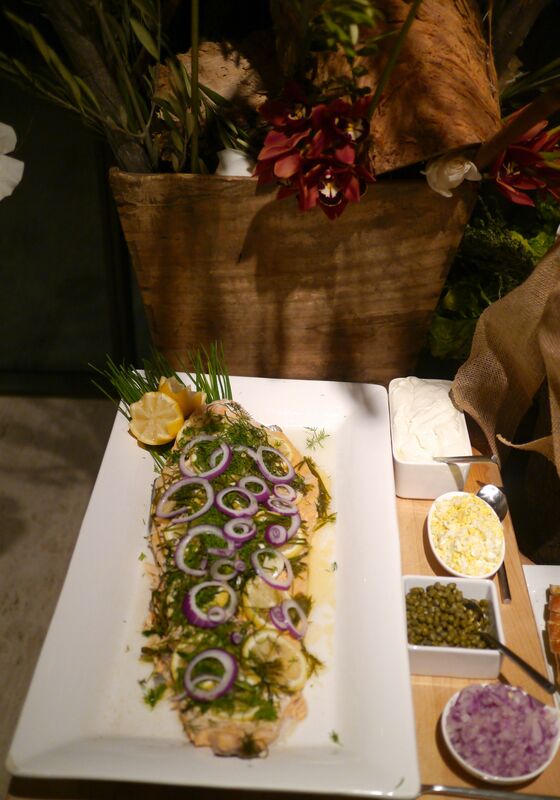 I did the food and floral design for the wedding of our dear friends Todd and Glenn. Everything you see in the photos to follow was accomplished purchased, prepared and “made real purty” in less than 48 hours. The invitation was for 6 o’clock in the evening and the sunset clearly was a sign of blessing for many years of happiness. 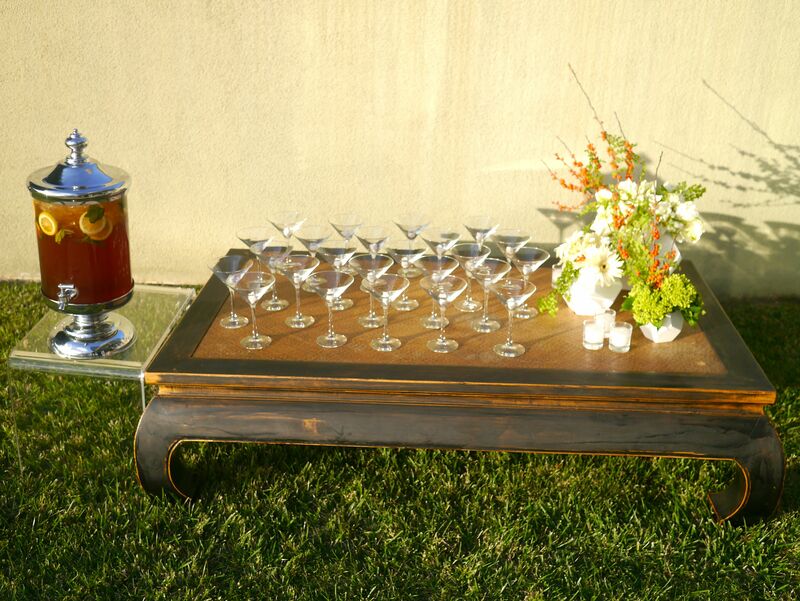 We moved the Asian inspired coffee table from the “round room” to just outside the entrance and greeted the guests with “Sweet Tea”…brewed black tea, simple syrup, bourbon, cointreau, lemon and mint…bringing our Southern roots to the West coast. 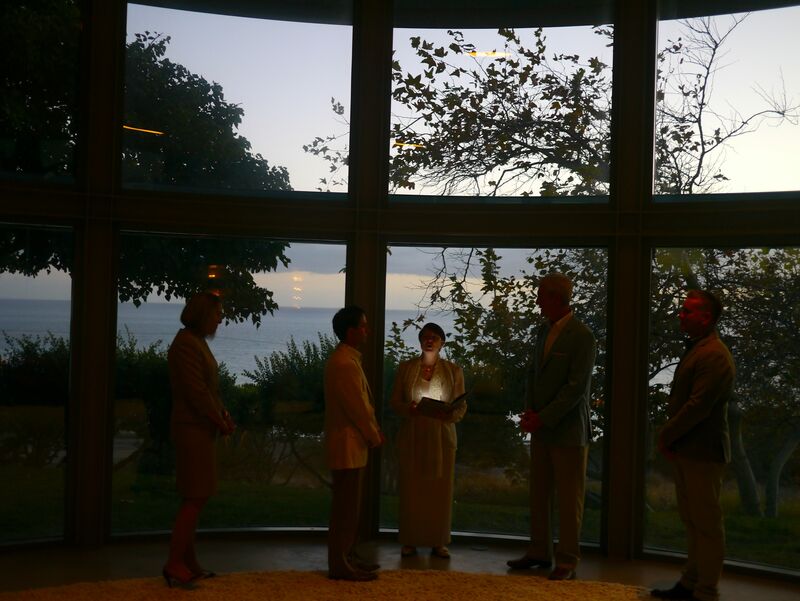 I can’t say that I’ve ever been to a wedding with such a thought-provoking and deeply meaningful ceremony. 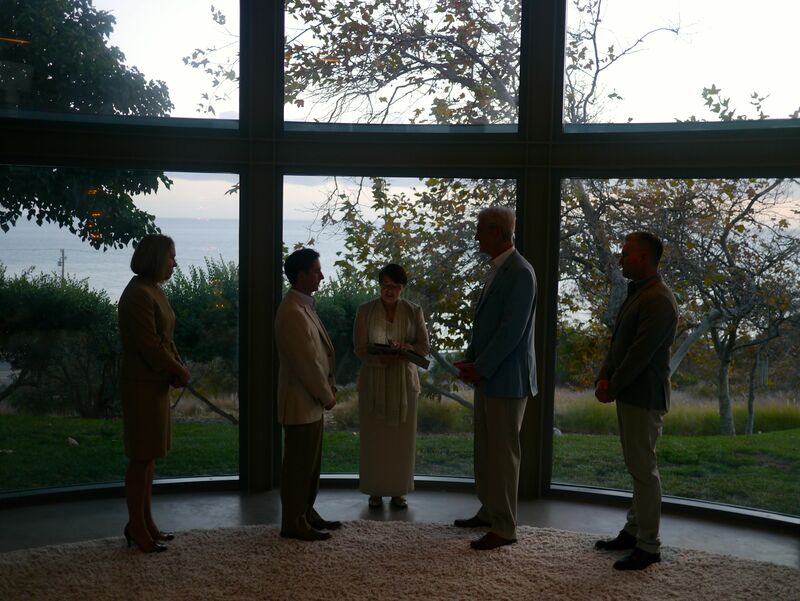 The officiate spoke eloquently as did the sweet friends that were asked to be the official witnesses. 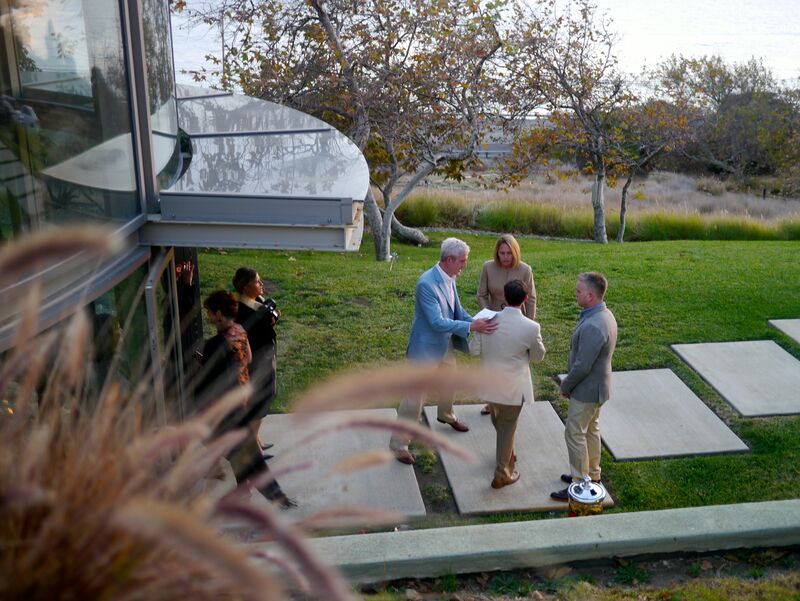 The guys shared vows with each other in their own words and the spontaneity of the evening ran the gamut from laughter to tears to jubilant applause. There’s a lot to be said for two people who love each other and those that support their love. There’s also a lot to be said for and to those that think there are limits on love. 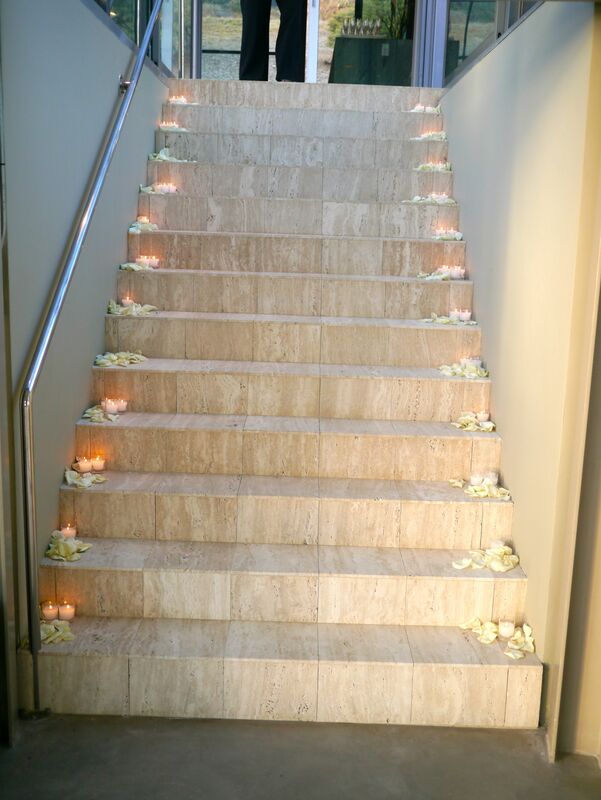 The candlelit stairs led the guests to the main floor for the reception. 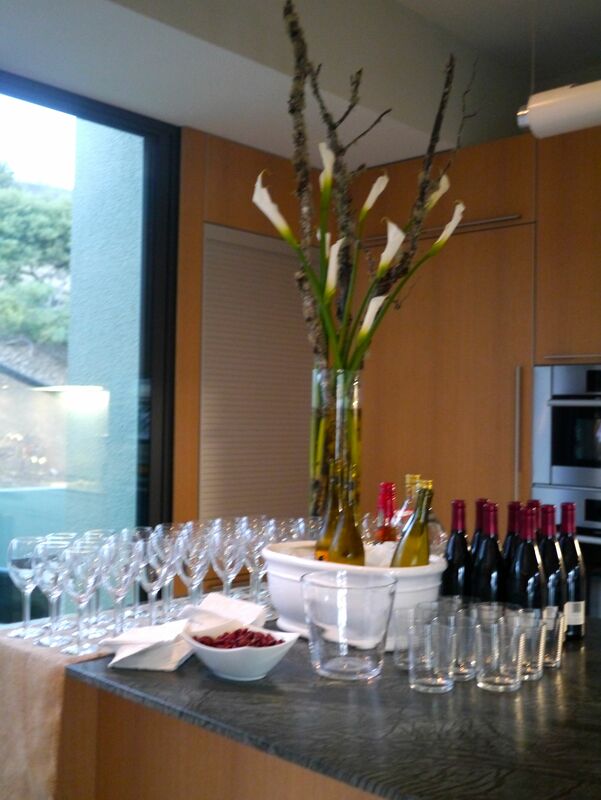 The kitchen bar you saw earlier was bedecked with libations fitting a joyous occasion. 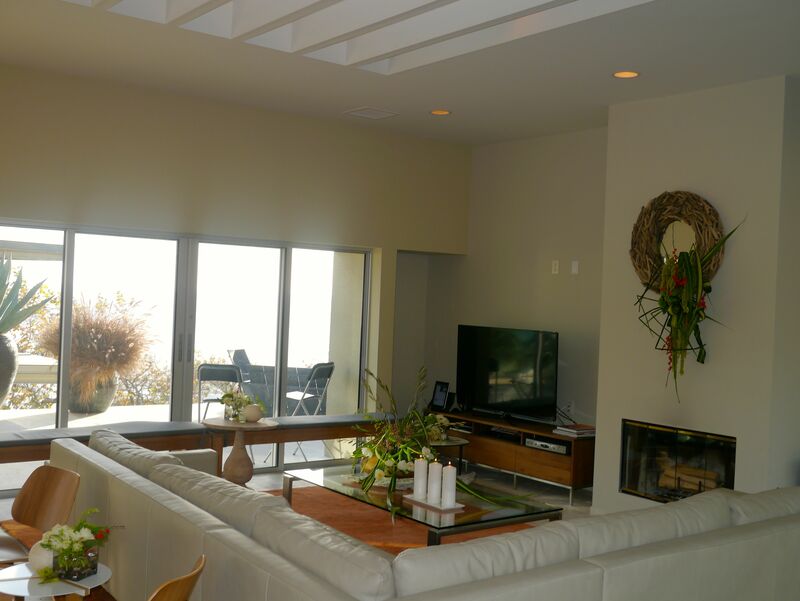 I captured the living area several times while natures lighting cast shadows in many directions. 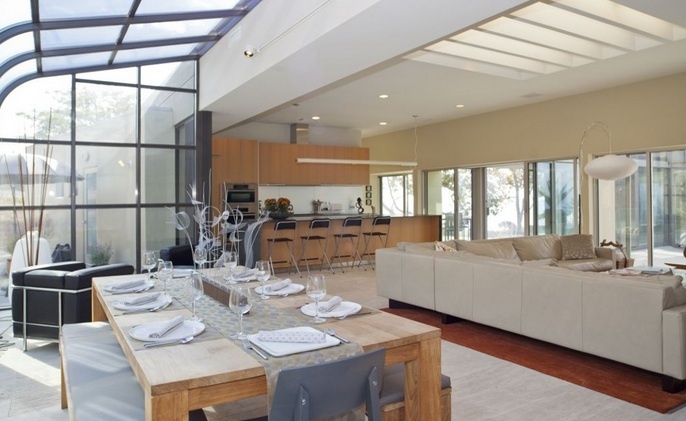 The room was rearranged to allow for conversational seating as well as eating and drinking. 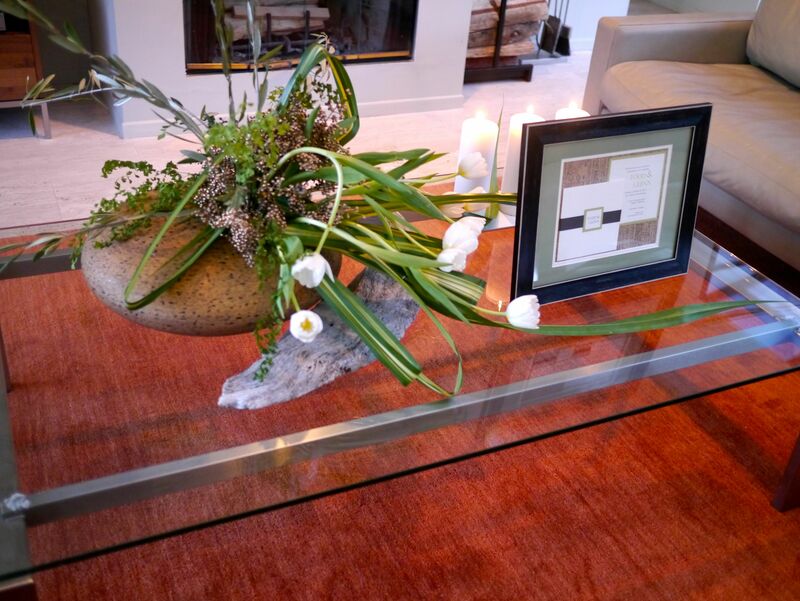 The designs on the coffee table and over the fireplace were created from local greens, white tulips, orange ilex, green amaranthus and gold gilded silver dollar eucalyptus. 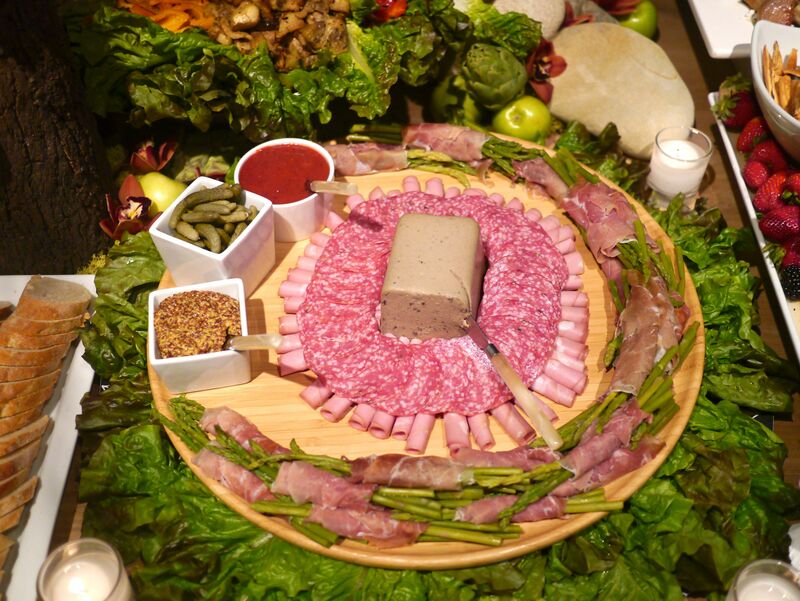 As the guests approached the table I told them that my mother would say, “I hope I’ve got something ya’ll can eat”. 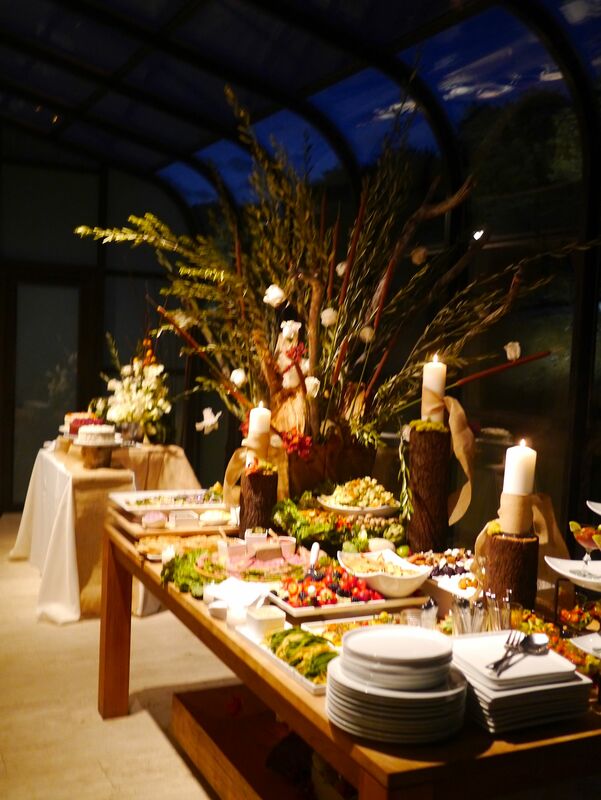 The dining table of the home, if not the focal point of the room initially quickly became just that. 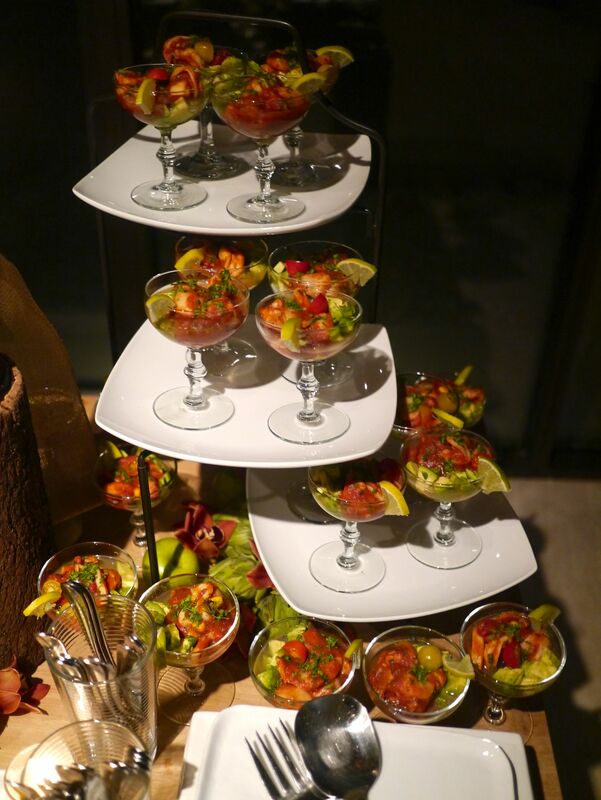 The guests were enamored by the array of fresh foods and fanciful preparations. 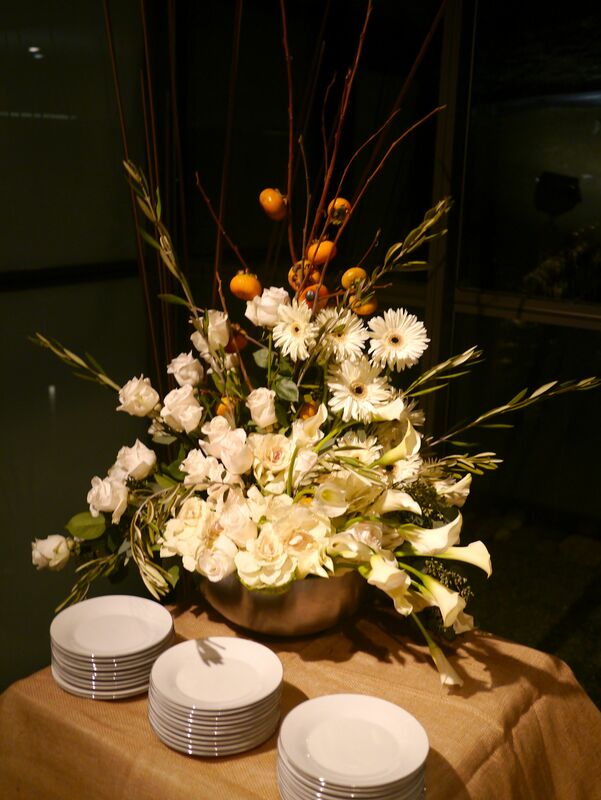 The floral design on the table anchored the organic design of the event by using a French water bucket that was holding sculptural quality pieces of wood found on the property and adjacent beach. 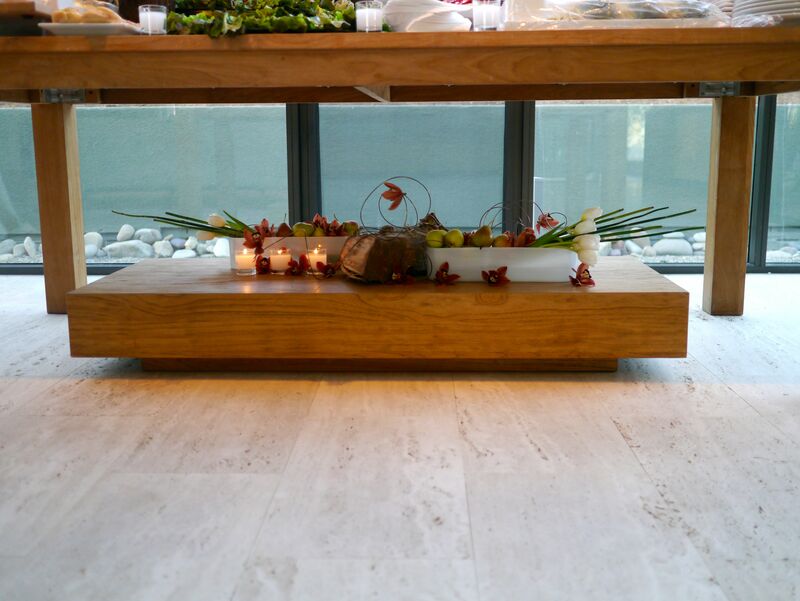 The owner asked us not to use this wood for firewood…so, we made it the focal point of the entire reception. I added drift wood staffs found on the back patio, olive branches and cattail to create the drama. Todd requested a bit of color so I used bronze wire and suspended Vendela roses from the branches. Then I clipped a bronze cymbidium stem into three pieces and created a low focal as if they were spilling over the side of the bucket. There was antipasti including grilled artichokes, yellow and red peppers, roasted eggplant and marinated mushrooms surrounding a family style bowl or orecchiette with roasted butternut squash, arugula, pancetta, pumpkin seeds and parmesan drizzled with Blood Orange Olive Oil…folks went crazy trying to figure out the ingredients. 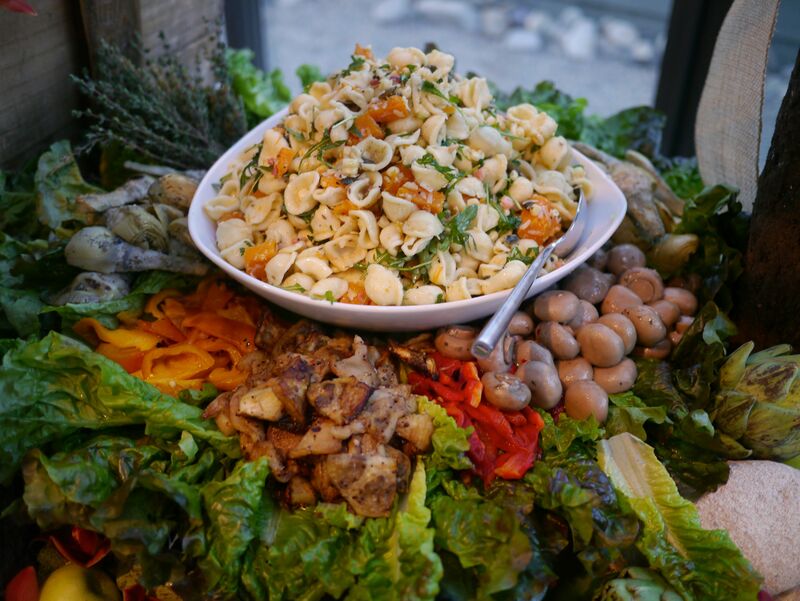 The Malibu Farmer’s Market (MFM) made me add items to the menu that I just could not walk away from. 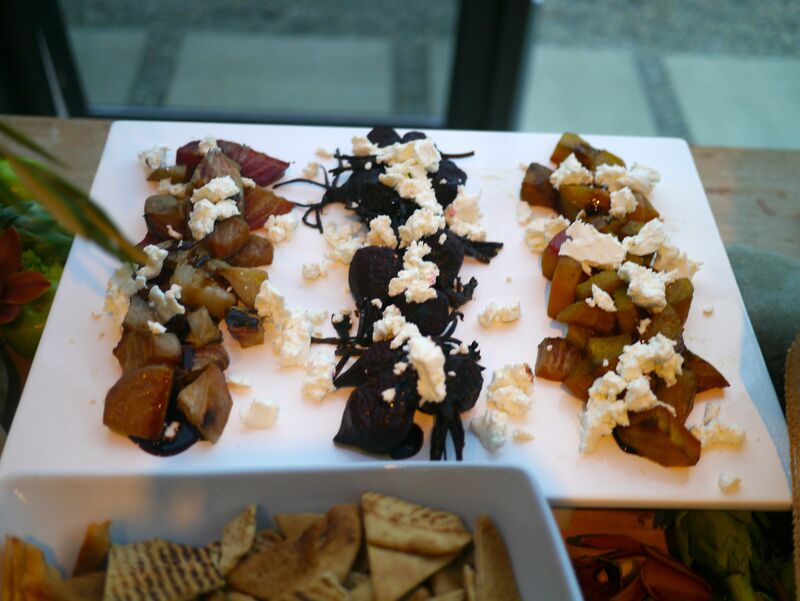 Who’s ever heard of beets being sold peeled and ready to cook…I had to do roasted beets with MFM fresh goat cheese and balsamic vinegar. 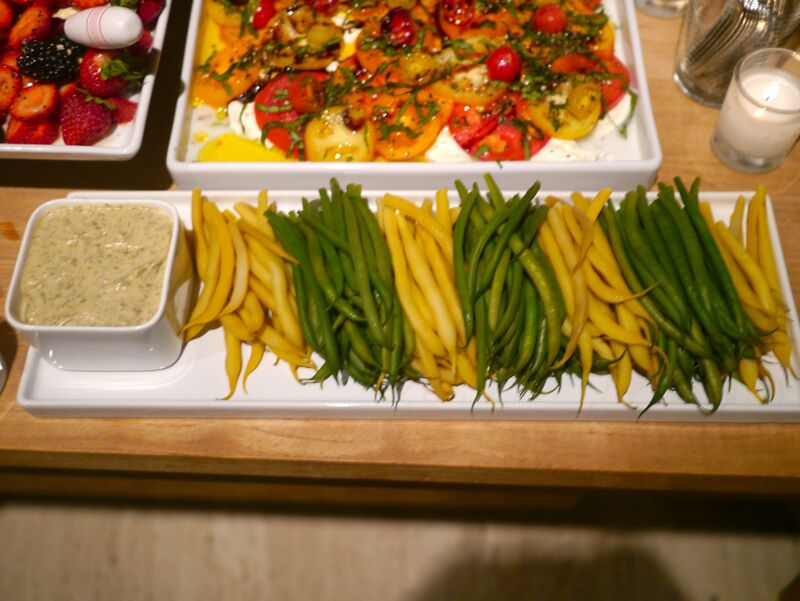 The beans were also too good to walk away from so we had steamed haricot vert and wax beans with lemon aioli. Also, I missed a full shot but in the bean photo you see a MFM caprese. The tomatoes were just spectacular and I found Burrata at the local grocer. I had planned to do Cambrazola all along but thought I would spread fig jam on it…simple, huh? But no!!! The MFM made me buy these berries…I mean really, they stopped me in my tracks. They were like eating a spoon of sugar. I’ve never had sweeter berries. 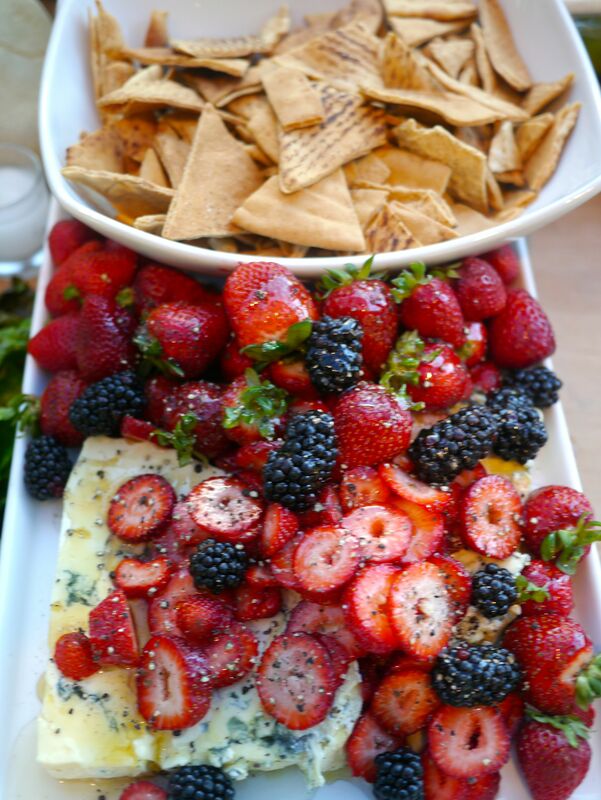 So, we had Cambrazola with fresh berries, white balsamic, honey and cracked black pepper. Todd’s cousin Melissa flew out from Franklin, TN to do the requested cakes…carrot, pound cake with chocolate glaze and italian cream. They were all beautiful and delicious. 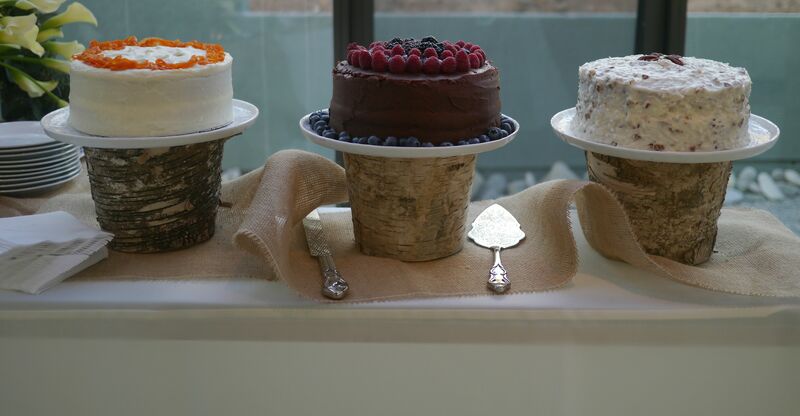 We had planned to have three cake stands but I found the birch bark cachepots in the flower district as well as the burlap and together they really created an elegant yet organic look. Okay, so I got a little “weddingiee” on this one but come on…there had to be something that said “this is a wedding, official and constitutional”. 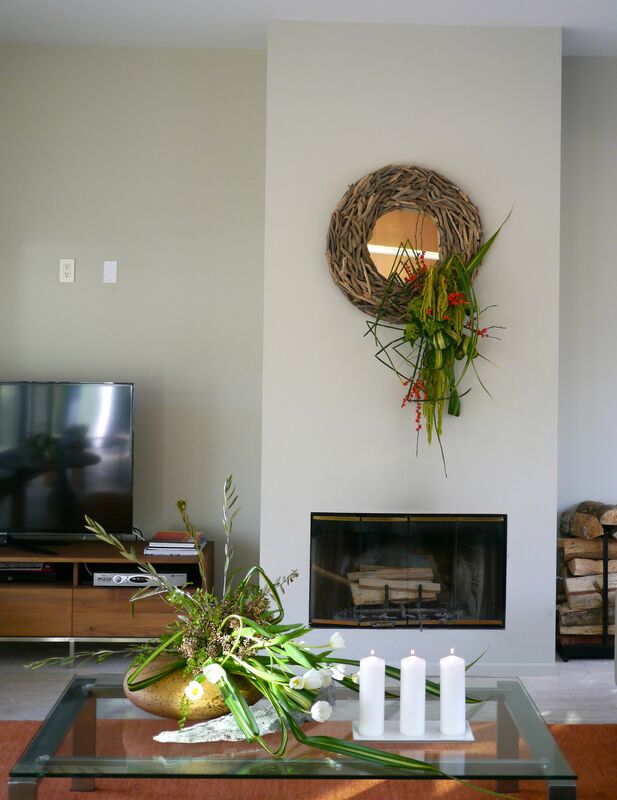 So, I said it with mini callas, gerberas, roses, ornamental cabbage and persimmon branches…then added the olive fronds to coordinate with the other designs in the room. Again, I captured the room in several lighting plots but the existing track lighting certainly helped to give the cake table a special glow. 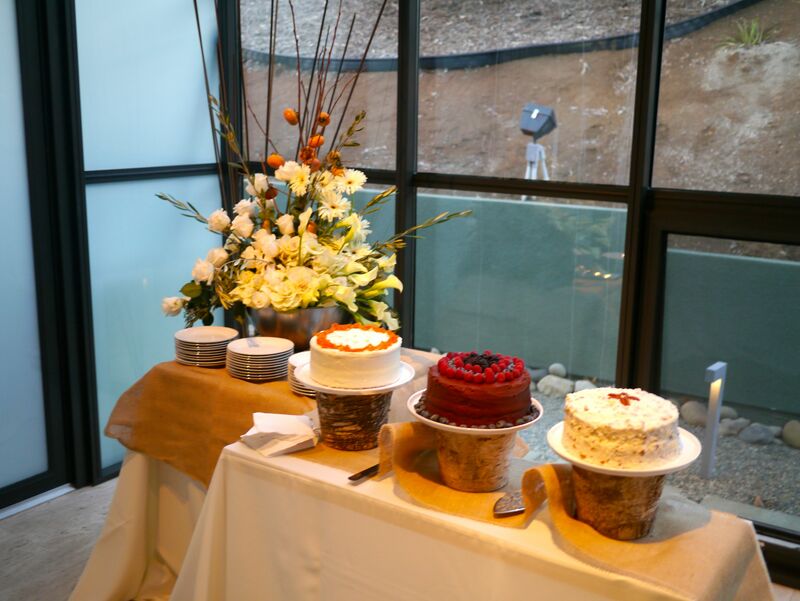 I used the “wedding flowers” on the table with the plates for the wedding cake…tucked back in the corner. It wasn’t the focal piece of the room but when guests looked that way they were reminded that this was a really special day!!! When you get two designers in a house…nothing is safe. 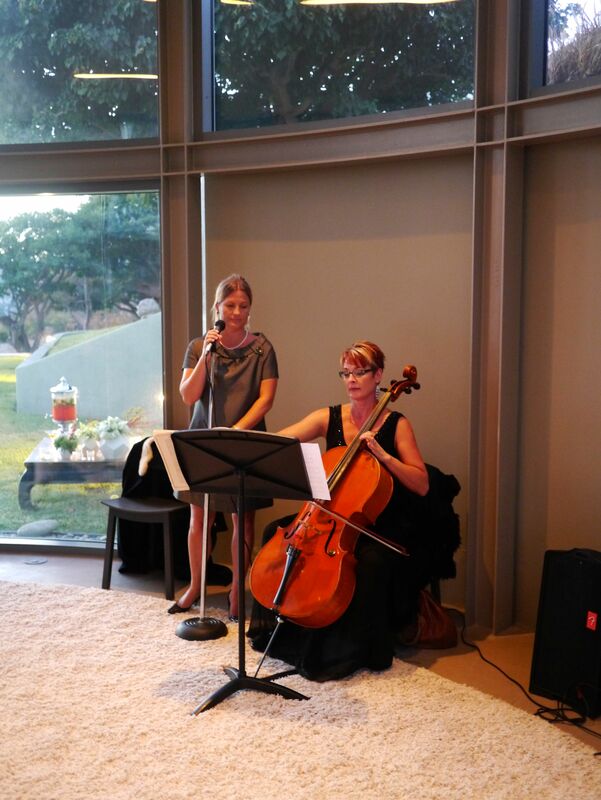 We fully intended for the house to be lovely and a good time to be had by all. We even decorated the table that was under the table because we had no where else to put it…and it certainly couldn’t just sit there. 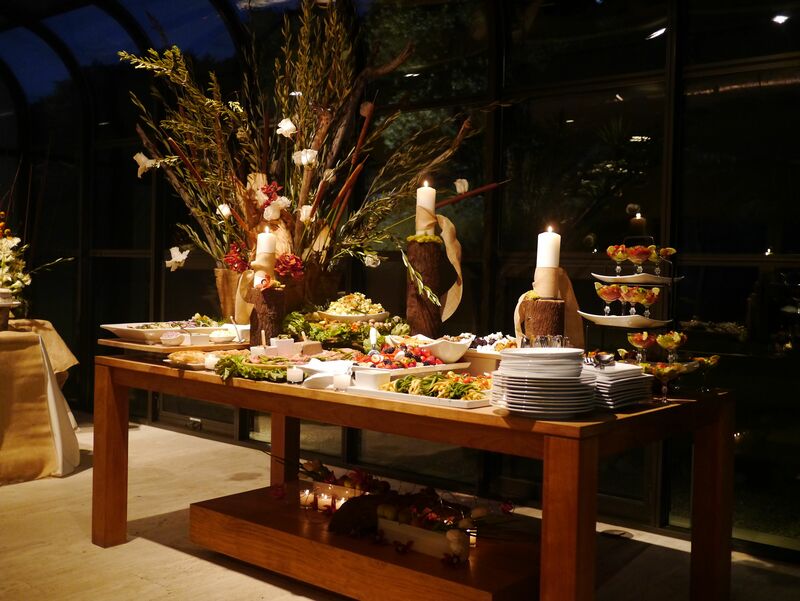 When Todd asked me to do the food and flowers he really had very few requests other than to keep it minimal. So I did as he asked. But, next time I do a party for him I’m going to ignore him and go all out!!! Next Post Very Merry Cocktails!!! even better than the first post…. incredible…. Wow! 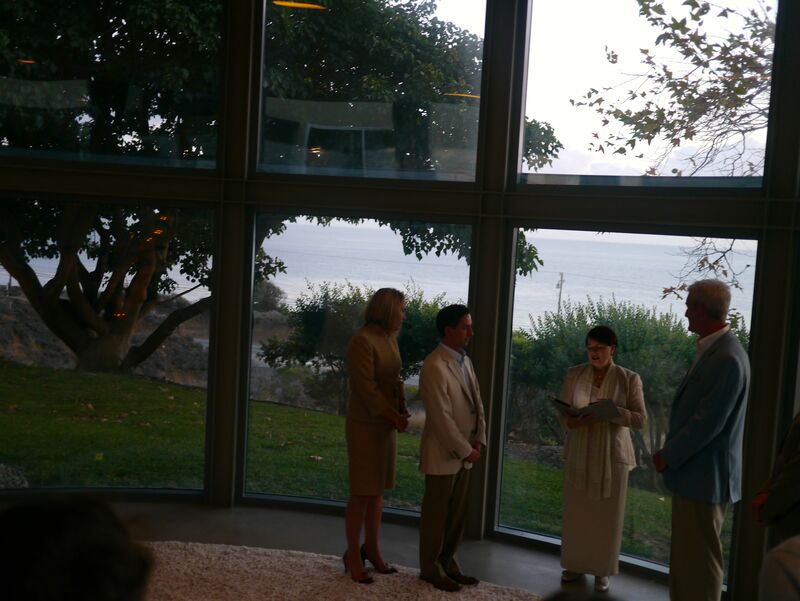 What a beautiful wedding indeed and so blessed that I was fortunate enough to be a part of it. Tim, you really outdid yourself and as you would say “fun was had by all.” Great to be able to spend time with you. It was gorgeous, delicious, and joyful inside and out. Thanks Tim! your +1, eliz.